The ePMP 1000 Connectorized Radio has the flexibility to connect to a variety of external antennas such as 90 and 120 degree sector, omni and high-gain panel or dish antennas. This versatility allows service providers to configure their network using high gain antennas to satisfy the most challenging environments. 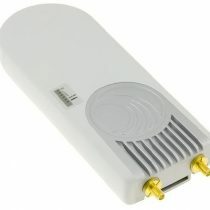 The ePMP 1000 Connectorized Radio can be configured as a Subscriber Module, an unsynchronized Access Point or a Backhaul radio. This radio will function as a client (slave) to an ePMP GPS Synchronized Radio in either a PMP or PTP deployment forming a GPS Synchronized solution.